The closure of the 24/7 restaurant stands as a measure of a storm's impact. What's a good way to measure the true impact of a hurricane or tropical storm? In 2004, former FEMA Director Craig Fugate created the unofficial "Waffle House Index" as a way to judge a community's status during a storm — and it's been used as a guideline for a major storm's severity ever since. As Hurricane Florence barrels through the Southeast coastline, so far about a dozen Waffle Houses are without power and closed in North and South Carolina. Already, the Category 1 storm has left 500,000 homes and stores across both states without power. Traditionally, if a Waffle House remains open in an area, it's considered safe to keep driving (many are located along Interstates); if it's offering a limited menu, then that means there are limited resources and some supplies might not be available. But if a restaurant is totally shuttered, then the situation is considered very severe since Waffle Houses are open 24 hours a day, 365 days a year. As spokesperson for the chain said that they only close when absolutely necessary. As my daughter was evacuated from her college in VA, I told her if she sees any closed Waffle Houses to keep moving inland! Thank you Waffle House. Former Floridian here. When Waffle House has to closed it’s bad news. When they reopen after a storm we all know it’s going to be okay. Stay safe! Waffle on!!!! Closing a restaurant is such a big deal to the Georgia-based chain that the company activates its own Storm Center to help support stores in areas affected by a major weather event. Waffle House also sends senior management to the area to oversee operations. "We are monitoring social media for information and also checking in with our vendors, the state and federal agencies and others to get have the resources needed to quickly get the restaurants back open," Pat Warner, a Waffle House spokesperson, told TODAY Food via email. The company also sends what they call "jump teams" to help run the restaurants so local management can focus on caring for their families and employees. Warner said about 100 people are now in the Carolina area to assist local restaurants. I remember managing a WH during extended power outage. We used gas grill to warm up water for coffee (luckily had enough ground beans). WH employees are impressively creative. It was warm without A/C, but patrons were so thankful that WH stayed open. Great atmosphere! 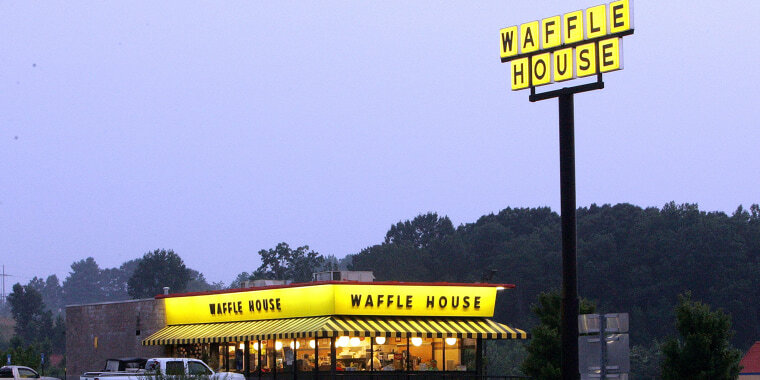 Hurricane Florence is not the first time a Waffle House has had to close it doors. Warner said around 90 were closed at one point during 2017's Hurricane Irma, largely due to mandatory evacuation orders. However, most were re-opened within three days. While Warner does not yet know when the North and South Carolina restaurants will re-open, he said he has no doubt that they will be up and running at full capacity as soon as they are physically able.